Phylogeography is a discipline concerned with various relationships between gene genealogies—phylogenetics—and geography. 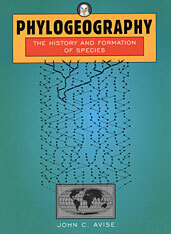 The word “phylogeography” was coined in 1987, and since then the scientific literature has reflected an exploding interest in the topic. Yet, to date, no book-length treatment of this emerging field has appeared. Phylogeography: The History and Formation of Species fills that gap. The study of phylogeography grew out of the observation that mitochondrial DNA lineages in natural populations often display distinct geographic orientations. In recent years, the field has expanded to include assessments of nuclear as well as cytoplasmic genomes and the relationships among gene trees, population demography, and organismal history, often formalized as coalescent theory. Phylogeography has connections to molecular evolutionary genetics, natural history, population biology, paleontology, historical geography, and speciation analysis. Phylogeography captures the conceptual and empirical richness of the field, and also the sense of genuine innovation that phylogeographic perspectives have brought to evolutionary studies. This book will be essential reading for graduate students and professionals in evolutionary biology and ecology as well as for anyone interested in the emergence of this new and integrative discipline.